Möller's deutsche gärtner-zeitung 1928, xliii. 46. Mesembryanthemum truncatellum Hook.f. non Haw. Mesembryanthemum turbiniforme N.E.Br. non Haw. Lithops hookeri var. dabneri C013 TL: 25 km S of Kimberley, South Africa. Bodies (paired leaves): Obconical, truncate, top surface flat to slightly convex. The face is elliptical more or less equal. The fissure is shallow 3-7 mm, the lobes are conjunct. This species is characterized by an obscure network of simple and forked groves and lines, and numerous irregular small island enclosed by groves. Margins are irregularly incise with narrow lines tapering out of the grows. This species is quite variable and the colours and face pattern varies considerably in plant from different provenance. 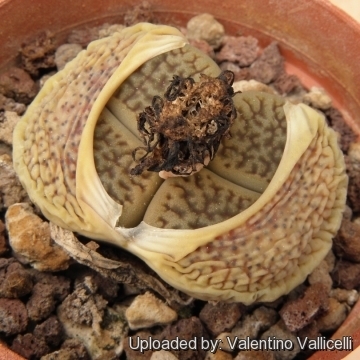 Lithops hookeri (A.Berger) Schwantes: var. hookeri Cole numbers: C110, C112, C113, C114, C118, C142B, C340 (Vermiculate form) C023, C051, C335, C336T Usually without windows and with rare dusky dots, but with an obscure network of simple and forked groves and lines, and numerous irregular small island enclosed by groves. Margins are irregularly incise with narrow lines tapering out of the grows. The colour of the margins and face island comprises opaque brown or buff or greyish, reddish, pinkish or orange-brown. Channels and grooves are opaque or very obscurely transluscent greenish brown or grey, greyish or brownish green, orange or reddish brown or red. Lines dull dark red. Shoulders as for the face dull grey. Lithops hookeri C023 (vermiculate Form) 55 km SW of Prieska, South Africa: very fine jagged pattern. 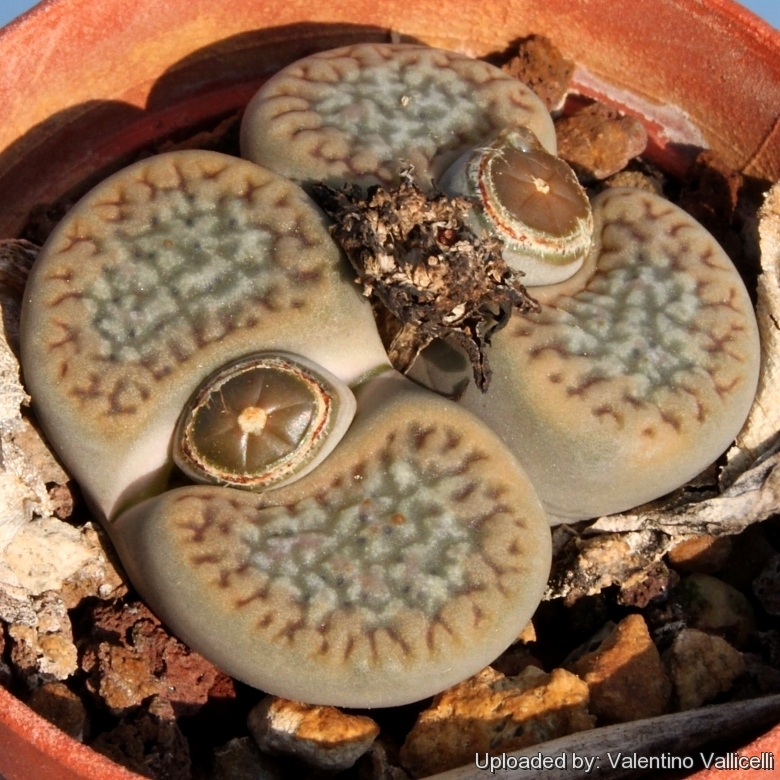 Lithops hookeri C051 (vermiculate Form) 15 km NW of Strydenburg, South Africa: has dark red jagged lines. Lithops hookeri C110 50 km NW of Marydale, South Africa: deep dark red jagged lines. Lithops hookeri C112 40 km WNW of Prieska, South Africa: deep red jagged lines, rusty. 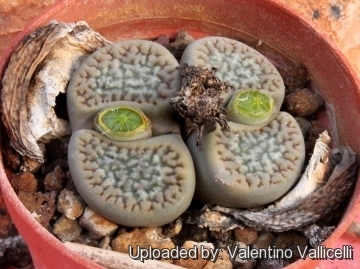 Lithops hookeri C113 10 km NW of Niekerkshoop, South Africa: dark olive brown top. Lithops hookeri C114 15 km NW of Niekerkshoop, South Africa: rusty pink, red lines. Lithops hookeri C118 25 km W of Strydenburg, South Africa: rusty grey, jagged lines. Lithops hookeri C142B 30 km NW of Niekerkshoop, South Africa: dark brown, red jagged lines. Lithops hookeri C335 (vermiculate Form) 30 km WSW of Strydenburg, South Africa: numerous small bumps. Lithops hookeri C336 (vermiculate Form) 45 km SSW of Prieska, South Africa: furrowed channels. Lithops hookeri C340 Near Marydale, South Africa: bold humps, lightning lines. Lithops hookeri var. dabneri (L. Bolus) D.T.Cole: Cole numbers C013, C085, C301 Differs from type for a relatively frequent presence of shadowy, obscurely translucent windows. Shoulders, margins and island opaque grey or bluish, pinkish, or brownish grey or greyish brown, often slightly more intensely coloured around the margins, Channels various shades of obscurely transluscent slate-grey, dark bluish or greenish grey or greyish or brownish green. Lines dull dark red. Dusky dots dull dark greyish green. Lithops hookeri var. dabneri C013 TL: 25 km S of Kimberley, South Africa. : dark red lines. Lithops hookeri var. dabneri C085 35 km W of Kimberley, South Africa: grey top, red jagged lines. Lithops hookeri var. dabneri C301 20 km NNE of Douglas, South Africa: deep jagged lines. Lithops hookeri var. elephina (D.T.Cole) D.T.Cole: Cole numbers C092, C093 Differs from type for the wider and shallower channel and for the generally absence of rubrication. Margins and islands opaque grey tinged, pale pink or brown. Channels obscurely translucent greyish green, grey or greenish grey. Rubrications (if present) very obscure dull red. Shoulders opaque grey to brown. Lithops hookeri var. elephina C092 TL: 10 km N of Britstown, South Africa: dark grey, dark lines. Lithops hookeri var. elephina C093 25 km NE of Britstown, South Africa: dark rusty grey body. Lithops hookeri var. lutea (de Boer) D.T.Cole: Cole number C038 Quite the same as var. hookeri with large island and coarse network of grooves. The margins, shoulders and islands varies from opaque beige tinged with with pink, brown, yellow or orange. Channels various shades of opaque or very obscurely transluscent orange-brown, orange-red, brown, red-brown or greenish grey. Rubrications blood-red. Dusky dots dull dark greyish green. Lithops hookeri var. lutea C038 TL: 5 km NE of Groblershoop, South Africa: bright orange-red. Lithops hookeri var. marginata (Nel) D.T.Cole: Cole numbers C035, C137, C338; (Cerise form) C088; (Red-brown form) C053, C089, C154, C155, C337 This is one of the more variable variety for face colours with a tendency to wider channels and more open windows. Shoulders, face margins and islands, opaque yellowish, greenish, pinkish or brownish grey, yellow or pink beige, reddish grey, the margins often obscurely banded with more intense colour. Windows and channels various shades of obscurely translucent greyish or brownish green, greenish brown, greyish red or dark grey. Rubrications bright to dull dark red, orange-red. Dusky dots dull dark greyish green. Lithops hookeri var. marginata C035 TL: 25 km SE of Hopetown, South Africa: olive green tinged pink. Lithops hookeri var. marginata C053 (red-brown Form) 25 km SW of Douglas, South Africa: pinkish grey, rusty lines. Lithops hookeri var. marginata C089 (Red-brown Form) 25 km ENE of Hopetown, South Africa: grey-red body, red lines. Lithops hookeri var. marginata C137 35 km E of Hopetown, South Africa: pinkish green. Lithops hookeri var. marginata C154 (red-brown Form) 30 km NW of Hopetown, South Africa: red brown lines. Lithops hookeri var. marginata C155 (red-brown Form) 30 km NW of Hopetown, South Africa: pinkish rust top, few lines. Lithops hookeri var. marginata C337 (red-brown Form) 30 km SE of Douglas, South Africa: finely netted top. Lithops hookeri var. marginata C338 35 km SE of Hopetown, South Africa: fine reddish lines. Lithops hookeri var. marginata cv. Shimada's Apricot Y.Shimada: It differs from var. marginata in its pinkish apricot colour. Distingushed for having obscurely transluscent windows with very shallow channels, obscure islands, dark brownish slate colour and polished appearance. Shoulders, face margins and islands various shades of opaque brownish grey, buff or greyish, yellowish, greenish or pinkish brown; the margins often suffused with a band of more intense colour. Windows and channels various shades of obscurely transluscent dark brownish slate, brownish green. Lithops hookeri var. subfenestrata C019 (syn. brunneoviolacea) TL: 40 km SW of Griquatown, South Africa: Murky windows. Lithops hookeri var. subfenestrata C021 TL: 15 km SSW of Prieska, South Africa: Rusty brown sheen. Lithops hookeri var. subfenestrata C156 5 km N of Prieska, South Africa: shiny dark rusty top. Lithops hookeri var. subfenestrata C175 20 km SSE of Prieska, South Africa: red brown, coarse. Lithops hookeri var. susannae (D.T.Cole) D.T.Cole: Cole number C091 This is the less reticulate form and also the smaller in smaller size. Shoulders, face margins and islands various shades of opaque cream or pale grey, often tinged with yellow, green, pink or pale brown, the margins occasionally banded with more intense colour. Channels various shades of obscurely transluscent greyish green, greenish grey, brown, or orange-brown, sometimes more intensely coloured in the margins. Rubrications obscure dull red. Lithops hookeri var. susannae C091 (D.T.Cole) D.T.Cole: deep jagged lines, grey. 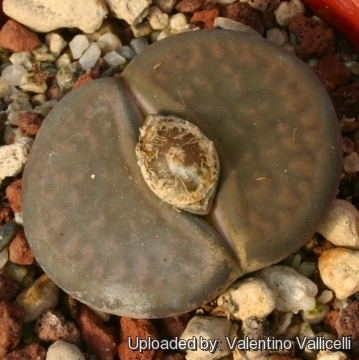 Lithops hookeri cv. Envy S.A.Hammer: The plant is yellowish-green in colour, but is otherwise the same as var. hookeri. Notes: In the winter season the plant doesn’t need watering, but they will still be growing, the new bodies will be increasing in size as the old outer leaves begin to shrivel. In fact the plant in this time extracts water and nutrient stored in the outer succulent leaves, allowing them to dehydrate relocating the water to the rest of the plant and to the new leaves that form during this period until the old leaves are reduced to nothing more than "thin papery shells".